Before you know it, spring will be here and we’ll all be outdoors more and enjoying some sunshine. Early spring is a good time to plant since it’s not too cold or hot. While not everyone might have a green thumb, perfect family activity is to plant a tree together. Since most families are so preoccupied with their busy lives, it’s very much needed to connect and do something together. Planting a tree or a garden is fun for the entire family and bonds you even closer. If your lawn doesn’t have space for a tree, a small garden, be it flowers, vegetables or herbs is also a wonderful choice. Trees and gardens will grow right along with your children and will not only teach them responsibility but also provide you and your family with great memories. Trees are a beautiful addition to any backyard lawn. Get the entire family involved in what kind of tree you want to plant. Some popular choices are the American Holly tree, which can grow 15-50 feet tall with beautiful red berries on them; Dogwood trees bloom in spring, and Red oak and sugar maple are also very popular choices and do justice to any garden. You might also want to plant a tree to give you more privacy in your garden from the neighbors. The ‘Green Giant’ Arborvitae tree is often used for that and is fast growing. Choose the best spot for the tree. Make sure there are no obstructions or any sort of electrical wiring underneath. Now let the real fun begin! Depending on their age, kids can use play shovels or real tools to dig a hole deep enough for the root and twice as wide. Then firmly pack it with soil around it. Kids will enjoy this messy part! After the soil is all around the planted root, start patting it down using tools and your feet. There’s no reason to just keep calling it ‘the tree’. It’s a part of your lovely family now, so let the whole family suggest names for it, and may the best one win! Trees need to be maintained, especially when they start to really grow. Like us, they can get diseases. According to fasttreeremovalatlanta.com if you notice discoloration of leaves or barks, this could be a sign that something is wrong with the tree. Bacteria and fungus are often the culprits behind this. You can contact experts who might be able to save the tree. Besides diseases, a healthy growing tree might need trimming every now and then depending on what kind of tree it is. You can also plant a garden bed of fresh vegetables, herbs or spices. People who prefer to cook with natural herbs or home grown vegetables will sure get a kick out of this! 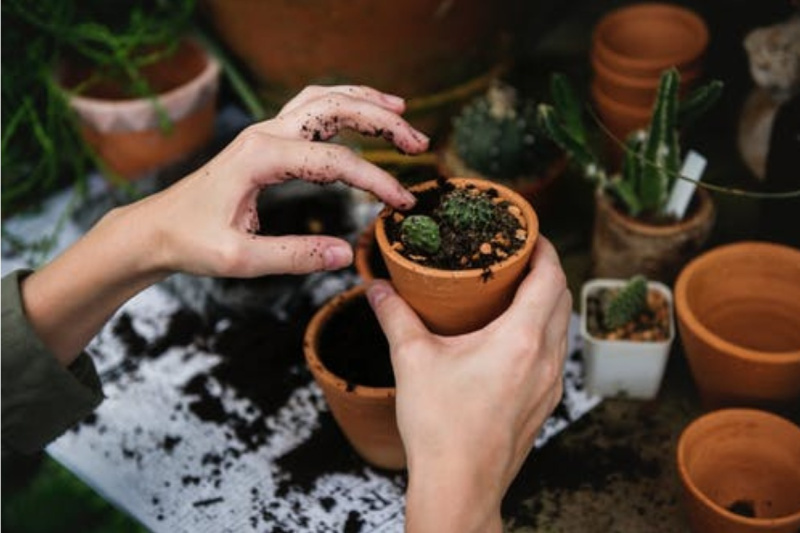 Basil, coriander, lavender, oregano, roses, jasmines, tomatoes, lemons are all just a few choices out of hundreds of things that can be planted in a backyard. As with a tree, decide together as a family what kinds of things you would like to plant. Moms and dads can first check the space that would be needed, and come up with lots of choices that your kids can then choose from. You can go with a theme for a garden. So maybe you want only a rose garden. Or maybe a garden with different hues of orange. These are types of themes and could revolve around a type of plant, flower, or color. There are literally hundreds of themes you can use. Try to find a theme that means something to your family. When planting a garden, separate plant containers are usually used. But for more creativity, if you have baby shoes that your children have outgrown, they can be used as a container to place the soil and seeds into. This will add a beautiful personal touch and give children a true sense of their input on the work to be done. Some people also use cracked eggs. Wash the inside of both halves of cracked eggs and plant in them. After some time, you can plant the entire half shell into the soil of your garden. It’s no secret that kids love colors. So, if you prefer using containers or pots, buy ones that children can paint a color of their choice on or draw something on them. Stripes, polka dots, hearts, diamonds, or solid colors, the list is endless of what they can draw on them. There are many ways to incorporate your child’s name into whatever you are planting. You can plant a vegetable or plant that begins with the first letter of your child’s name, so that Peter can plant the potato, and Tom the tomato, for example. Better yet, you can help your kids design their initial on the soil itself, so that a bed of what’s been planted is in the shape of a letter. If you have enough space, you can use the whole name and you will find things to plant that begins with each letter of their names. These were just a couple of ideas to get started with. As the adult, make sure you task activities according to the age of the child. Young toddlers can plant seeds and water them, while older children would be more skillful in digging, for example. Children need the outdoors as much as possible to benefit their health and their understanding of the world. Getting them involved in gardening will teach them new skills. Gardening itself gives beauty to your backyard. It also helps the environment, and it’s just nice to sit in a beautiful garden. On hot summer days, you can sit under the shade of a tree you’ve grown together. It will bring your family closer in doing something fun and memorable. I am really enjoying reading your well-written articles. It looks like you spend a lot of effort and time on your blog. I have bookmarked it and I am looking forward to reading new articles. What an informative article! Really enjoyed this good read, I highly recommend for anyone starting to landscape their property with a garden or planting a new tree. When it comes to pre & post-planting, some may notice bugs/pest, bacteria or unexpected hurdles along the way.